David Catrow is an editorial cartoonist and the illustrator of more than seventy books for children, including the New York Times bestseller I Ain't Gonna Paint No More! 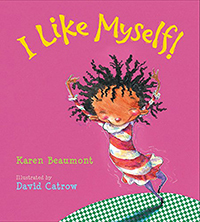 and I Like Myself!, both written by Karen Beaumont, Dozens of Cousins by Shutta Crum, Plantzilla by Jerdine Nolen, and Rotten Teeth by Laura Simms. High on energy and imagination, this ode to self-esteem encourages kids to appreciate everything about themselves—inside and out. Messy hair? Beaver breath? So what! Here's a little girl who knows what really matters.